Every consumer or patient call into a health system’s call center is an opportunity to create a highly-personalized experience that ensures patient loyalty and extends patient lifetime value. Healthcare providers have a tremendous opportunity to invest in solutions and processes that can transform their call center into a profit center by driving smarter patient engagement. Yet, the majority of call centers today do not deliver the robust, personalized support capabilities today’s patients and consumers expect, and the current healthcare marketing environment demands. 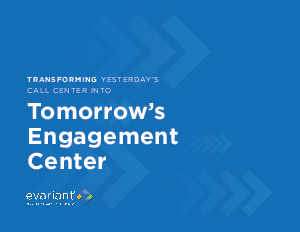 Download your free copy of this eBook to learn how to make the transformation from traditional call center to strategic patient engagement engine that drives growth in patient acquisition and lifetime patient value.